In Light Navy with blue leather seats. 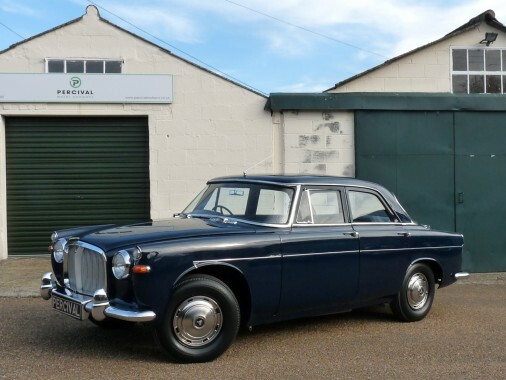 Supplied new in 1962 by Andrews Garages of Derby, this fine 3.0 litre saloon Automatic has a recorded mileage of only 16,000 miles which is believed genuine. An elderly lady bought the car and, as she couldn't drive, entrusted her gardener to act as her chauffeur for trips to church and local runnng around. The lady passsed away in 1975 and the Rover remained in the garage, we think for about ten years. A retired bank manager bought the rather grand house with the car included and set about trying to get it up and running, apparently to no avail. In 1992 the Rover was advertised in Motor Sport and a Rover collector that we've known for many years acquired it. He had it up and running shortly afterwards and kept it until 2014 when it then passed to a very good customer of ours with a little help from PMC. Whilst the car was cosmetically superb, the lack of use had taken its toll slightly so some time, and money, was spent attending to faults with the brakes, heater, fuel gauge and clock. The engine started to run poorly and it was discovered that the cylinder head had coked and sludged up. The head was stripped, cleaned thoroughly and rebuilt with new valves, seals and gaskets as necessary. The radiator and cooling system were flushed through. This work is all documented. A lovely period car ready for use.